After SOPA and PIPA are queue for the mean time... we have another big problem which is worst that the past bills. ACTA is formed by 39 countries including the 27 European Union, the United States, Japan, etc.) which could really affect our daily lives specially to those people who lives in the country that agreed with the ACTA law. Everything around us will be affected the internet censorship, freedom of speech, your online activities will be watch and probably you will lose your internet when they prove that you did an illegal action againts ACTA. Just like the problem in SOPA and PIPA, even using a pop-music from an American Property you're already violating ACTA. It would impose new criminal sanctions. It could help to protect the copyright specially of the expensive goods to prevent fake copies. Musicians and other media related stuff's HD copies will be remove. Sharing your own knowledge (self discovered) to A and A will share it to B. Since A and B doesn't own the original knowledge, they can get in prison. Freedom of Speech will be affected. Share a media file to your friend through messenger with copyright. 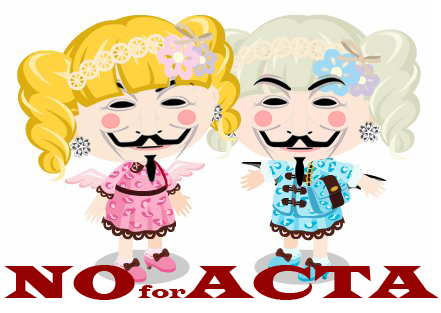 What ACTA can affect us? Our freedom of speech will be restricted. I'm so upset because Japan agreed with this agreement! Did you notice it? Mostly who joined the agreement are WEALTHY countries that brings strong effects to other countries even it is not about for ACTA. Imagine that if our freedom of speech will be restricted, then WHAT THE HELL IS HUMAN RIGHTS FOR?? These wealthy countries are really controlling the word and I don't know why, why their governments do these things even though they know that 99% of the people lives in this world will be against their laws and bills. If they restricted our freedom of speech, means, they could approve laws on their own way and on how fast they want. Means it's really for controlling their people though, they know their people are against with their plans. I can't Imagine if they copyrighted everything we learn. How about those stuffs we learn in school? And being shared? Means, those stuffs will be checked and censored for government's own privacy? THEY WHY WE HAVE SCHOOL? What is the reason for us to go to school if we will learn low quality of information? When the time came that they kept on copyrighting, blocking every copyrighted on the internet until nothing left, then what's the purpose of this internet? I can't imagine loosing my online friends from other countries! How can I communicate with them if there is no internet? We will be like old modern style, sending letters and pay for stamps? What about the under 18 internet users who share files to their friends? They will be in prison too? Oh wait, let me remind you... the legal age of getting in prison is actually 18 in other countries but still... nothing is impossible! Laws can do everything... aren't they powerful? I can't imagine this anymore! Even though out of 240+ countries, 3 of them agreed, all of the countries, people in the world will be affected! Can't they just think of other way aside from killing us? I think they are too much! Better we also support Anti-ACT! So yeah, after the interview, I got an offer from Libby. She asked me if I would love to join Pico Model's Hall of Fame. And of course! I didn't had any doubt so I accepted it as soon as I read what she said. It's just that reminds me of Lady Gaga's album, The Fame and The Fame Monster. "Its for the picos who have changed pico in some way for the better"
YEAH, I'M THINKING ABOUT LADY GAGA! MAYBE I WOULD TURN OUT LIKE THIS? So! If you want me to be the Pico Model's First Pico in their Hall of Fame, Vote ME on their poll now! We have posted last time on our post, Accused that our mom is being accused by the people who know nothing and the ones who only see the pad side. Mainly, the real reason of the accusement was because of Aya's message she sent on Ameba Pico Support. 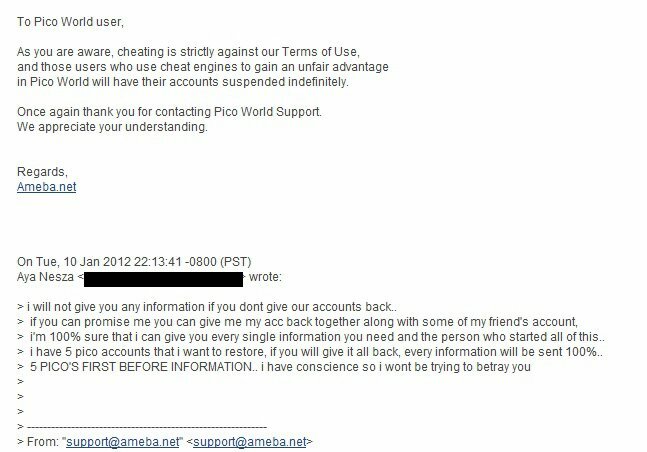 Telling that if Ameba Pico will give her account back, she'll tell everything about the cheat. And as much as you can see... there were no agreement happened that time. People used this message as a proof that Aya is the reason of everything they lost. Though, I'm sure that it's a misunderstanding and they over reacted of what they saw w/o analyzing well. 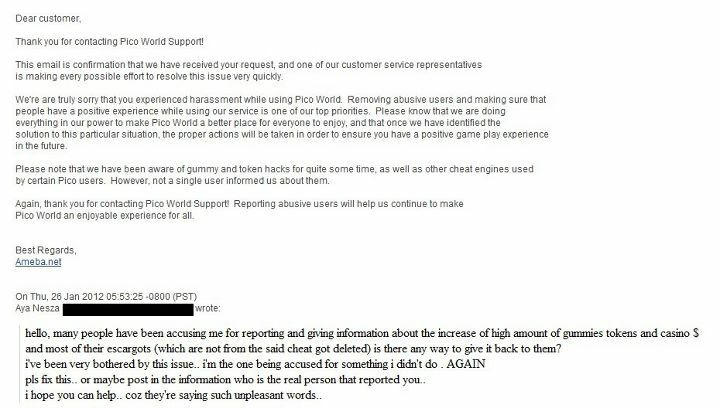 I've been saying that it's impossible if the Admins/Staff doesn't know what's happening on their game. And just like on Ameba Pigg, they took your gummies, tokens, casino dollars and fishing point when you cheat it so I think it's better than banning their users. If you are not convince with the things I've just said... well, look at this image. 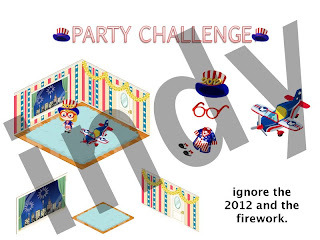 Oh well, based on Indy Étoile's leak, there was 2012 on the hat and probably pico will remove it as well as the fireworks at the window when it's night. Good thing they only removed the 2012 on the hat and leave the fireworks... I WOULD LOVE TO SEE FIREWORKS! Of course you are able to use casino perfumes! Show time wigs in Camera! Another cool hairstyle is here for everyone in Pico World! It's so fashionable and really cool! Have you already checked them? Of course! Pink & Blue would be always available!!! These items are sold in David's shop. PLUS!!! There is one of the coolest actions ever and I love this so much! I LOVE CAMERAS! Check out some of our style with using these new wigs!!! Like it? Get your's now!!! [David Shop] Showtime Wigs & Camera Action! As you can see, not only her who got banned last December 2011 regarding the latest issue about the cheat. Some where innocent as well! Just, I don't want to name the people I know who got banned.. I don't want them to get in in this issue. Also, not all people who get ban are criminal. Some of them are innocent! Two of our friends got banned because their AG went suspicious. But then, it was proved that there was nothing wrong about her purchase so she got her account back. People on casino said, "everyone's escargot and other casino stuff are gone because of her. She wanted her account back and in exchange of that, others have to lose their items!". Hello? Do you know what you are saying??? Oh, and hey! How about the other picos who got ban? Aren't they also suspicious on reporting as well? Of course they would want their accounts back! Then why putting the blames on Aya! Also, don't look down to ameba pico admins. Of course, the know what's happening on their game!!! Please. Stop thinking out of this world. Be mature and think well! Stop blaming someone w/o a proof that he/she is the responsible one! Cuz how could my friend be temporarily bann because of her AG? Then who reported her? COME! THINK! It doesn't mean that she did a wrong thing, means she's already a bad person and you'll keep on focusing on the bad side. That's terrible! If you lost your escargots, tigers, gums and tokens because of cheat... then, accept that you didn't deserve it. Don't blame somebody else because it just shows you are guilty and can't blame your own. If you lost your escargots and tigers even though you didn't cheat it but you cheat after getting the expensive stuffs,.. accept that it was taken as a punishment. And for those people who lost their expensive stuff even though they did nothing, 100%... it's not Aya's fault because she isn't the one who took it from you. It's you're responsible on taking care your OWN account even you asked someone to do it for you. Remember, you wanted it! And it's the Ameba Pico Admins/Staff who are responsible for the behavior of their gamers. Come to think of it. Which are you going to choose? A punishment which admins will only get the stuffs you didn't deserve? or getting banned like you got expel? THINK! I officially revealed my self last January 22, 2012 in our fan page. My first post of my picture was a 'baby-look' which I took on the day I'm going to post my picture in real and it hit till more than 300 likes! 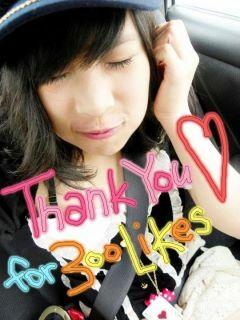 100+ like for my Hatsune Miku Cosplay picture + 5 shares. I was really surprised of everyone's reaction on seeing my '7-13 years old picture' like even though I'm already 17 in real! Of course! This is the first time I officially publicize my look in real life in our fan page and I'm so grateful for every comments and likes I had receive. Thank you very much everyone! Aside from that! Mia won't let her self become late! Stay tune and she'll reveal her self as well!! We have been lots of wonders ever since people became aware of 'Étoile'. I know most of you know the meaning of this word in french is 'star'. But, how does people pronounce it? We've been wondering around since it's not an English language, maybe people are already takin it mistakenly w/o being aware. So how does people pronounce it in real life? 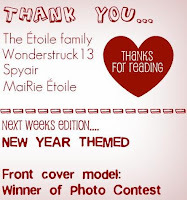 Last January 23, we had a small trivia in our fan page asking everyone on 'How do you pronounce 'Étoile'. So how does the result end up? Most of them voted 'E-toi-le' just like how you spell it as it is which was really obvious to have the highest votes.. but its WRONG. Only few people got the right answer, out of 170+ total of votes as for now, only 4 people got the right answer which is 'Et-wal'. Yes, that's the right pronunciation of this french word that you have became aware of. We will be having more polls soon so, stay tune!! Hello everyone! Mia and I have been receiving reports about our posers these past few days. We both Mia and I have new pico for this new year with new Pico Name and together with that, we have new posers. So, how could you identify real Mai in Mia aside from Stars, Casino cards, Profile description, URL and buddy numbers? Able to Send Message : To hear your messages, request, questions or reserving an schedule for interview and for more other purposes. But now, I cannot answer message from this account. Sorry. Buddy Request Open : To let everyone be friends of me! Though it's always buddy requests exceed. If you are confuse so much on how are you going to find the real one, please remember that Mai & Mia don't use other special characters aside from * on our name, alphabets only. So if the time came and you got really confuse, this is the best way to find out if it is real or not. Hope this will help a lot! See you guys! 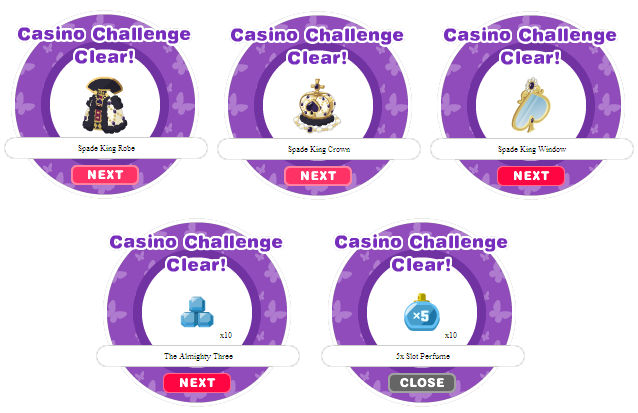 Another Casino Challenge! Really, I'm so tired on slotting! Can't they stop it for a month? I want a rest as well for laptop! well anyway, these past events, their challenges are my types! Really it has something to do in a Royal family which I will not going to let it pass away w/o getting it! So don't miss it too! I rarely open my room since I publicize that I have a new account as well as Mia for this year 2012. Well, this is actually for adjustments in a lots of things and it's such a big help to me! I rarely open my room and actually, I just open it when I wanted. I thought that I wanna hide and just be MaiRie(which is my other account) and only chosen people will know this account. But the news spread so fast and I don't have anything to do about it and let it be! Since January 12? I started opening my room (sometimes) to meet people until everyone knew about it and today, I got the 100 faves! I can't really imagine it and I'm so happy! I also rarely make events to let people to fave my room and that's why I'm really surprised about this! Really, Thanks to my supporters! 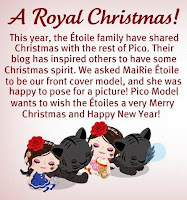 Pico Model's one of the special edition was released last January 4, 2012 with a cover of MaiRie's Santa-Reindeer outfit! Her outfit was released on last year's Christmas and was sold in Santa's Place with our Favorite Red Rose and Angelic Wings! AS YOUR MODEL THIS MONTH! Many of my friends came into my room and supported me on spreading the news regarding the new acts in United States of America to support the petitions of the popular websites in the internet.. My friends and I together protested inside my room.. I also made room events and there were people who are curious of what SOPA and PIPA is and finally aware of what's happening in the internet world. The latest news about this hottest news is that the vote on January 24, 2012 was postponed in senate since the bill had no chance of getting enough votes.. Aside from it, SOPA is delayed as well. SO! This is actually a good news for now but still, we don't know if they continue it again. There have been a big issue in cyber in whole world since yesterday, January 18, 2012 regarding the SOPA (Stop Online Piracy Act) and PIPA (Protect IP Act). SOPA and PIPA are for the protection of copyrights of the owner to avoid piracy in the internet to simplify, they are for Anti-Online Piracy. Basically, SOPA and PIPA are to protect copyright of the creators and obviously, there have been users who uploading illegal content and unauthorized files which is considered as criminality. Google and Wikipedia are one of the popular sites that protested against the censorship or anti-piracy legislation from the SOPA and PIPA that are aiming to stop online piracy on American intellectual property. If these acts passed, there's the fact we loose popular and useful sites such as Google, Yahoo, Twitter, Facebook, Youtube and more. Based on our research, Facebook is also considered as one of the websites that provides piracy such an illegal uploads which is possibly to be block by the law. On behalf of this issue, Facebook will close on March 15, 2012 is not true. Facebook is not going to shut down because of SOPA and PIPA on the said date. It is just a false rumor, an hoax, a fictional story that was delivered from "Weekly World News" which is impossible to happen. Most of the people who aware regarding the issue thinks that it has something to do with SOPA and PIPA, and the truth is, it is not. If Facebook closes, it is possibly because of the approved acts and not because of the reason said on the online tabloid site. If Facebook will close because of the stress that Zuckerberg had been experiencing and the site is getting 'out of control' then why don't they just give us a notice directly from Facebook directly on their home page? Besides Facebook is also against the SOPA and PIPA act. Mark Zuckerberg says "Facebook takes online piracy and copyright infringement very seriously but we believe the PROTECT IP Act (PIPA) and Stop Onlince Piracy Act (SOPA) are not the right solution" which obviously saying that they are not planning to close Facebook because of this acts. The original version of this hoax was last year, March 15, 2011 which is just updated and brought out from the past to present time. So don't panic! We shouldn't focus on the "Facebook will shut down issue". We should focus more about the SOPA and PIPA because it could affect many sites since most of the popular sites these past few days are founded in America where the law enforcement is happening.. Does it have something to do with Ameba Pico? Or other games? Mr. Zuckerberg is right. The acts are not the answer to stop the piracy. Though, the copy right holders already have the ability to remove infringing material from the Internet. As far as I know, it is called Digital Millennium Copyright. One of the example is YouTube. Lots of videos which are removed because of the copyright holder claims the media you have been uploaded and there is no way that YouTube would approve your video. Remember, most of the popular sites such as Yahoo: where we usually make our e-mail adress, Google: that has the free weblog called blogger/blogspot, Facebook: where we play Ameba Pico and more are founded in United States and Ameba Pico is a game from Cyber Agent AMERICA which could possibly affect by the acts since SOPA and PIPA are made by the lawmakers of U.S.A. If SOPA and PIPA passed, facebook can be blocked. 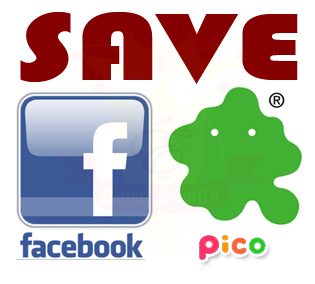 How about the Ameba Pico users who registered their account through Facebook? Obviously, we are affected and possibly can't play the game. How about the money we spent for the game? Remember, it is impossible to take it back. Then. how about the friends we met through cyber? How we could find them again? What will happen now??? NO YAHOO + NO FACEBOOK + NO PICO = ? NO YAHOO + NO BLOGSPOT =? don't you think, we, the gamers can be affected as well? Isn't Facebook and Ameba Pico has copyright? Yes, Ameba Pico has copyright even Facebook as well. Any websites have copyright even the free websites where we make an account. Any Blog (ex. etoile-sisters.blogspot.com) from a copyrighted site (etoile-sisters.blogspot.com) can be copyrighted by the author. Just google the meaning of URL to understand more. Even a poem, music or tiny art can be copyrighted by the artist as long as you made it, you OWN it. Piracy is happening, but copyright of the actual site doesn't have anything to do with the SOPA and PIPA because, they do not own the media files that are uploaded on their web by their users. Remember that SOPA/PIPA are for Anti-Online Piracy. Even if a site such as Facebook has their own copyright but the piracy is happening inside site or in other words, their users violates law, Facebook is supposed to be responsible to do an action. But if there is SOPA and PIPA they might be the one to do an action, the first move by sensoring Facebook and until we can't able to access it anymore. Means, no Ameba Pico. Imagine if SOPA and PIPA are approved. Possibly, Youtube, Facebook , Twitter, Yahoo, Google or any sites where piracy is happening can be blocked. Even Blogspot which is under by Google can be affected. If these sites are blocked by the approved law, imagine how it could make the cyber world withered. Everything on Internet will be affected, ruined and destroyed. There are a lots of petitions about anti- SOPA and anti-PIPA. It is not yet the end. The house Of representatives in America will push forward the bill in February and there is a plan to have voting on January 24 for PIPA so it's not yet late! Sign the petitions we found and share to people! Twitter: #factswithoutwikipedia, #SOPAstrike, #wikipediablackout, #Censorship, #PIPA and #SOPA. I'm letting everyone to know this issue because SOPA and PIPA is a big problem in cyber world and real life because it could also affect our virtual life. So we are hoping that you can join on protesting SOPA (which can be the cause of the popular website to be censored like it is banned) and PIPA (which can destroy internet) for the future of the cyber world. PLEASE DO SHARE THIS POST TO EVERYONE! 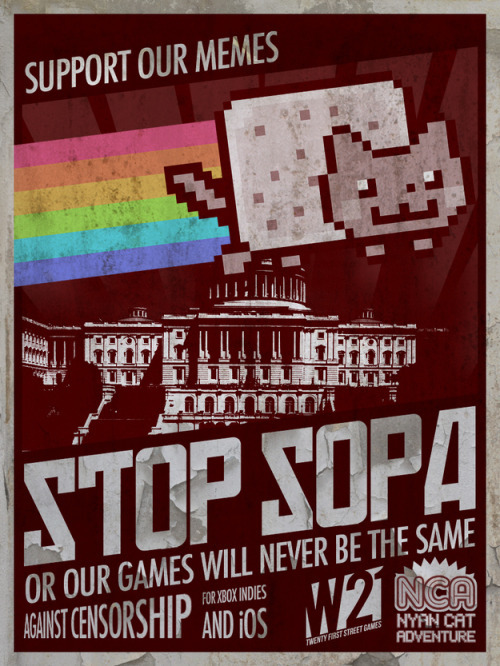 PROTEST AGAINTS SOPA AND PIPA! YOU HAVE THE RIGHTS TO SPEAK! IT'S PART OF HUMAN RIGHTS! After a very long time! I even thought I am not going to see her anymore and when I went online to AFK (lol) Rose hurriedly whispered me and say "NICKY ÉTOILE IS HERE!" I was so surprised seeing her after a long time not seeing her. I thought she won't be online anymore. I already flood her of my messages but then, I saw her fb saying she quit pico and after that she doesn't have any updates on her wall and I was really surprised to see her today! Also, Sexquisite which is Kxtten now is finally active again on Pico! They are coming back! YAY! Zye and Nicky made my day. And then, I called other Étoiles to meet Nicky and Zye specially Ape and Eric who haven't meet them before. Isn't the latest Challenge Cool? You guys know that this one is our type and yeah! Actually, right now, I'm wishing they will put the heart version of it! Like in Alice in Wonderland! I know it will be cool! So don't miss and get these cool Royalistic Stuff now! [Returns!] Winter Skate Park is BACK! PINK AND BLUE LEOPARD ARE HERE!! It's Mai & Mia's Color! Yay! Both of us were so excited on playing gacha just to get some items specially the outfits and they were so great! Though, the wigs doesn't suits us. We look like a... well, wanna take a look? See?! I can't really explain our looks. It doesn't really suits us even though we try to pair it with other outfit :/ WHY? WHY? WHY?! Oh well, We really like this one so we hope you do as well!! There, those are the items you could get from the gacha. We hope that you get the items you want easily! Goodl Luck! [NEW COLOR] Leopard Items in Pink & Blue!